The LA Times Reports that A tsunami advisory has been issued for coastal areas of California after a magnitude 8.3 earthquake hit central Chile on Wednesday. The tsunami advisory extends from San Onofre State Beach in San Clemente, about 55 miles north of San Diego, to Ragged Point, about 50 miles north of San Luis Obispo, according to the National Tsunami Warning Center. National weather officials expect the tsunami will begin to affect the California coast about 4:46 a.m. in Newport Beach travel swiftly, arriving a minute later in the Port of Los Angeles. By 5:06 a.m., the tsunami will arrive in Santa Barbara, and by 5:10 a.m., in Port San Luis. A “widespread inundation of land is not expected” for these advisory areas, with the tsunami's height not expected to exceed 1 foot. Forecasters expect strong currents and dangerous waves, and the ocean current could be especially hazardous for several hours, according to the Tsunami Warning Center. "Anybody is going to be susceptible to this. It's not like a storm -- where it only affects a particular area or southwest-facing beaches," said Stuart Seto, a weather specialist with the National Weather Service. "This is like a very long wave. But the first wave may not be the largest. It may go on for many hours." In anticipation of dangerous currents, the Orange County Sheriff's Department announced that all beaches, harbors and marinas would close there as of 4:00 a.m. No evacuation orders were issued in Orange County. 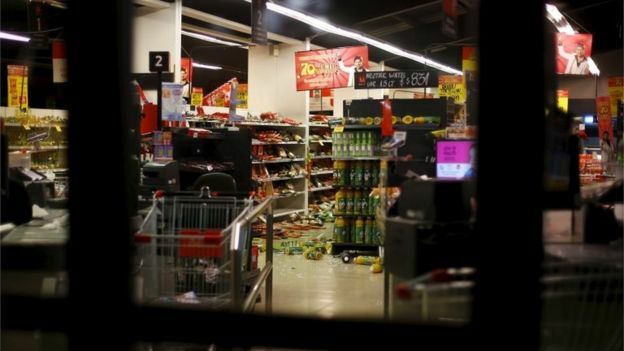 In Chile, the powerful earthquake was followed by at least three aftershocks above magnitude 6, according to the U.S. Geological Service. Those along Chile's Pacific shore, from Puerto Aysen to Arica, were ordered to evacuate and seek higher ground. The National Weather Service said that for Hawaii, the initial wave of the tsunami would arrive at 3:11 a.m. local time. A major tsunami was not expected for Hawaii, but sea level changes and strong currents could pose a hazard to swimmers and boaters as well as others near the shore. The threat could continue for several hours after the first wave hits, the weather service said. A tsunami battered parts of the California coast in 2011 after the deadly earthquake struck off the northeastern coast of Japan. The tsunami brought 6- to 8-foot surges that flooded beaches and harbors, splintering docks, crushing scores of boats and triggering the evacuations of residents near the shore. One person died, and marinas and harbors up and down the coast saw extensive damage. The waves from the 2011 earthquake were significantly larger than the ones expected to hit Southern California early Thursday. 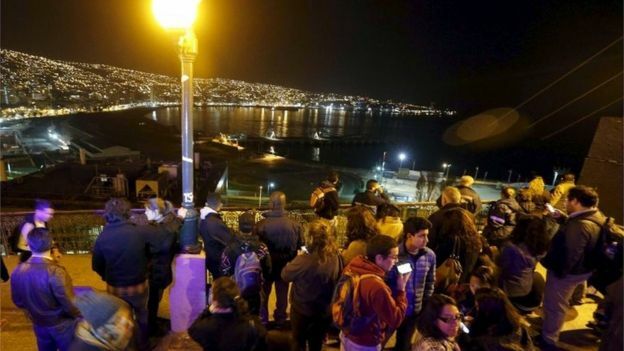 After the 8.3 magnitude temblor hit Wednesday, tsunami waves of 15 feet were observed at Coquimbo, Chile, while Valparaiso and Quintero saw waves of about 6 feet. Meanwhile between 3- and 10-foot waves could arrive in French Polynesia. Waves between 1 foot and 3 feet were possible along some coasts in Mexico, Ecuador, Japan, Russia and New Zealand. Following such an event are typically power outages and hard times in both the earthquake hit area as well as the tsunami hit areas. Those with advanced preparedness tactics will better weather the troubles ahead. Those with off-grid homes, devices, and preparedness will be most able to handle what may come. To our friends in Chile and surrounding South America, please stay alert and ready to deal with aftershocks. Coastal areas in the Pacific, prepare as guided and be alert! Feel free to share your story or send photos and video links to Offgridjourney@gmail.com. 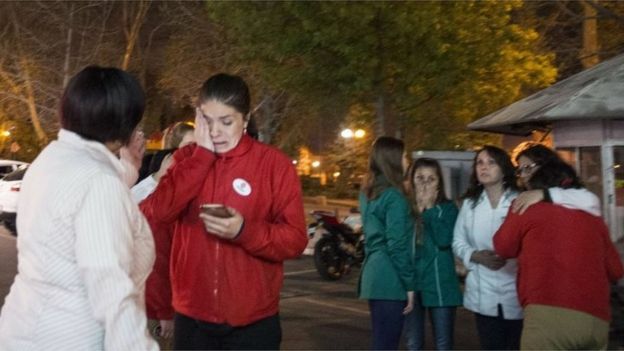 One million people had to leave their homes in Chile after a powerful quake hit the country's central region. At least eight people died when the 8.3-magnitude quake hit. One person is still missing. Residents of Illapel, near the quake's epicentre, fled into the streets in terror as their homes began to sway. In the coastal town of Coquimbo, waves of 4.7m (15ft) hit the shore. 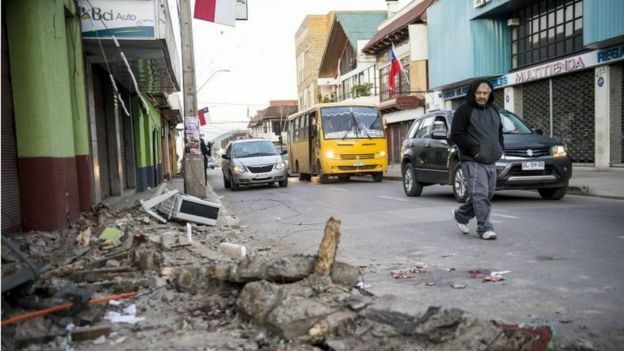 A tsunami alert was issued for the entire Chilean coast but has since been lifted. The quake lasted for more than three minutes and there have been dozens of aftershocks. I'm on the coast about 130km (80 miles) south from the worst affected area of Coquimbo. Our house is on top of a cliff and made of wood. It was shaking and shuddering. At first I thought it was just a tremor but it was really strong and went on for around three minutes. It was much stronger than any tremors I had ever felt before. The house is fine as most of Chile's buildings are built to withstand tremors. The local town was evacuated. The restaurant down on the beach is flooded but most things here are returning to normal. Officials said 1,800 people in Illapel were left without drinking water. Electricity providers said hundreds of thousands of their clients in the worst-affected Coquimbo region had no power. 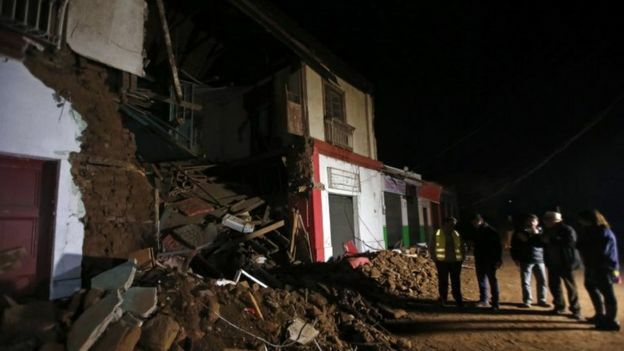 The US Geological Survey (USGS) said the tremor struck off the coast of Coquimbo, 46km (29 miles) west of the city of Illapel at 19:54 local time (22:54 GMT). 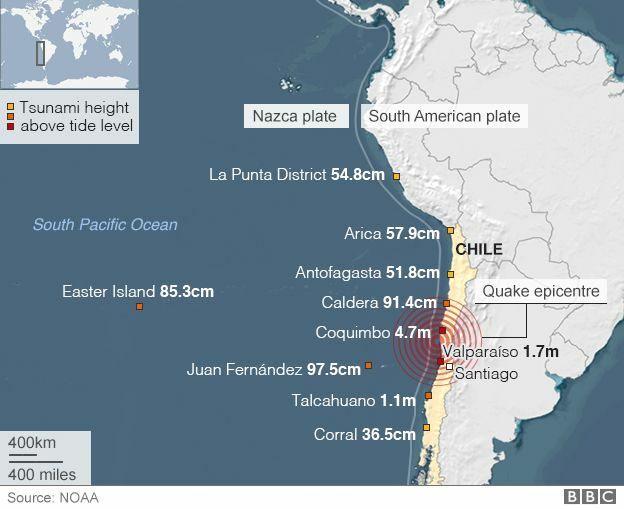 The USGS said it was at a depth of 25km, while Chilean seismologists calculated its depth at 11km. The quake that rocked Chile on Wednesday was five times more energetic than the one that devastated Nepal back in April. And yet the early indications are that the death toll will be a fraction (perhaps a thousandth) of what it was in the Himalayan nation. In large part, this is simply down to preparedness. 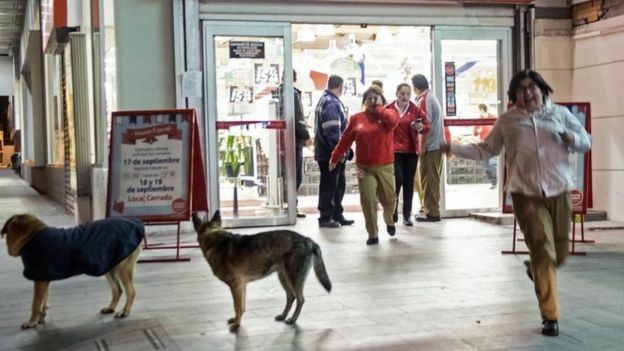 This was Chile's third massive quake in five years; the region all too frequently experiences magnitude 8 events. As a consequence, the building codes are strict and generally well enforced. What is more, the people themselves are well versed in how to react during and after an event. It is not perfect. In 2010, an 8.8-magnitude quake witnessed failings on the part of the monitoring network and the system for alerting people to the imminent tsunami threat. Since then, the Chilean government has spent millions upgrading the country's seismic network of sensors, and made improvements to telecommunications systems that share critical information and warnings. 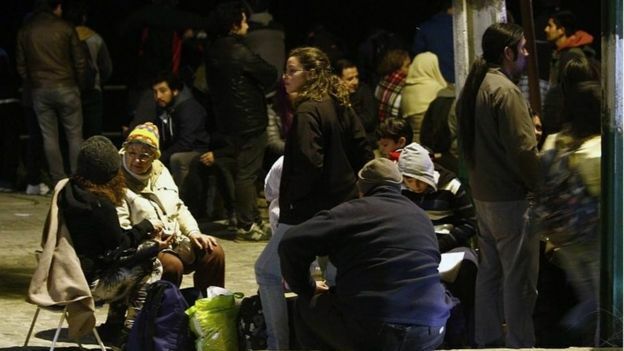 The earthquake struck as thousands of Chileans were travelling to the coast ahead of a week of celebrations for independence day. President Michelle Bachelet said some of the official festivities would be cancelled. The authorities were quick to issue tsunami alerts keen to avert a repeat of the slow response to the 8.8-magnitude quake in 2010, which devastated large areas of the country. More than 500 people died in that quake and the tsunami it triggered and memories of the tragedy are still raw. Tsunami alerts were issued shortly after the quake struck for the entire Chilean coast but have been gradually lifted, with the last cancelled at 06:22 local time. President Bachelet said that "once again we must confront a powerful blow from nature". She will travel to the affected areas later on Thursday. It runs along the boundary between the Nazca and South American tectonic plates. These are vast slabs of the Earth's surface that grind past each other at a rate of up to 80mm per year. Chile is a true example that planning and preparedness makes a big difference in how people are affected by disaster.